After a stressful but beautiful drive along the tight, little traveled roads of northwest Maui, we continued on to Paia and stopped at the Paia Fish Market. It was quite a scene. There was a line to the door about 30 seconds after it opened at 11am on this beautiful Saturday. I had the Cajun charbroiled Ono plate with fries. 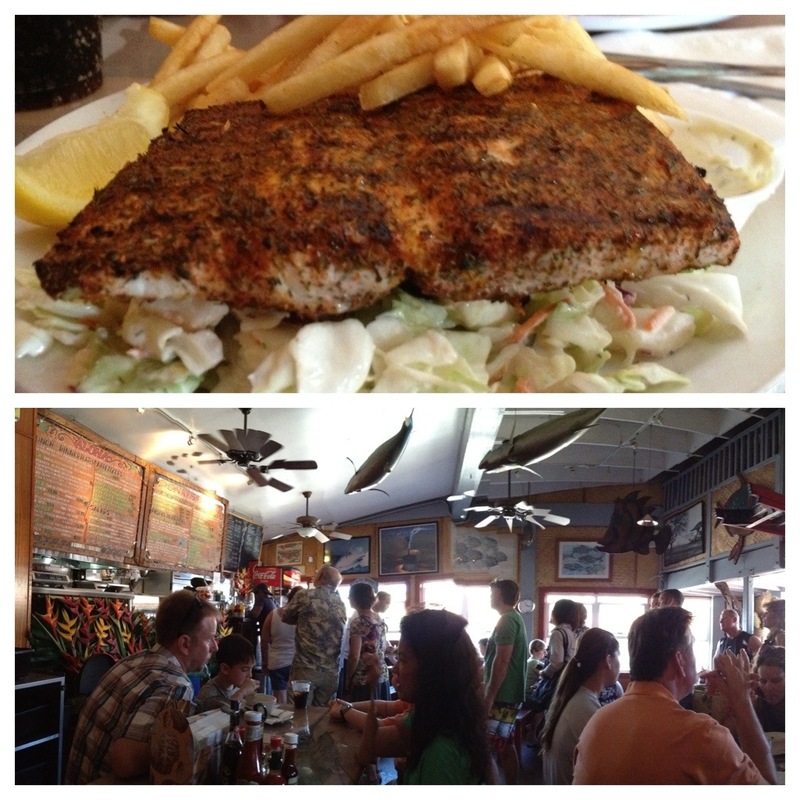 It came served on a bed of cole slaw with a side of tartar sauce and a lemon for $20.95. The Ono is a mild meaty fish that is frigging awesome. Gail had the Ono burger, which she loved (see picture below). It’s a small storefront and the panorama above encompasses the whole place. There are eight community tables set up like ores on a ship, each fitting about six to eight humans. We sat next to a guy from Orange County whose in the process of moving to Maui and building a house in Lahaina. He grew up in Montana and hates the cold, so he’s progressively moving towards the equator. He got married at the Ritz-Carlton. Nice guy. I never got his name. I’ll tell you, this is an island paradise, but I don’t feel the desire to move here. Just don’t, I need the change of seasons, I know this. After lunch we drove north on Baldwin to Makawao. Neat town. Here are a few other snippets. 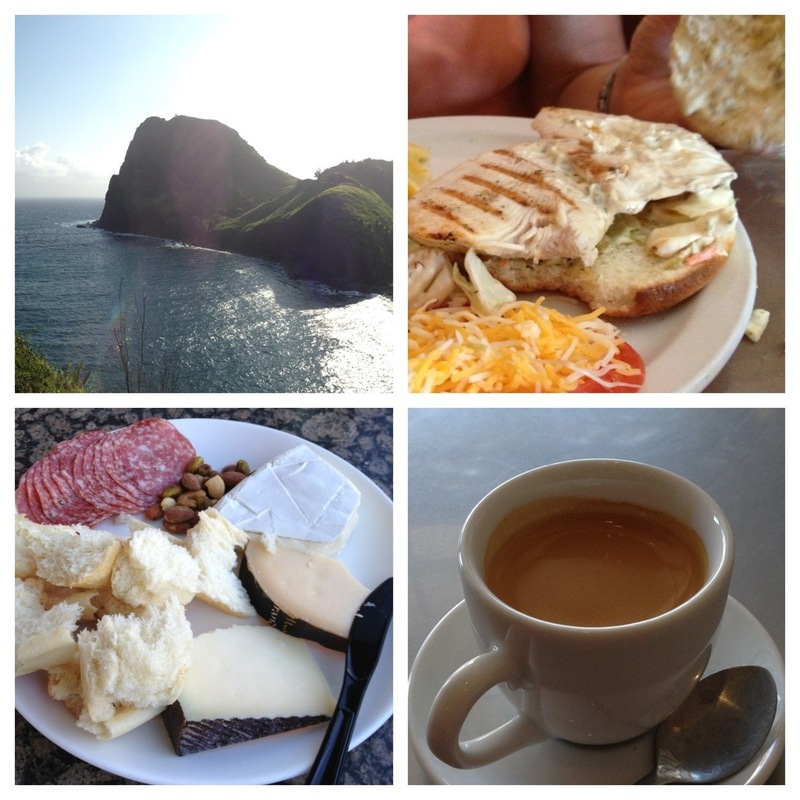 Starting in the upper left and going clockwise we have a shot of Kahukaloa Bay, Gail’s Ono sandwich, a great double espresso from Anthony’s Coffee bar in Paia, and Gail’s wine and cheese plate that we had for dinner.